A “phenomenal” former daily news editor described as one of Wales’ most respected journalists has died aged 75. Tributes have been paid to Stuart Minton, who passed away after suffering a brain haemorrhage at his home in Pencoed, South Wales, last week. 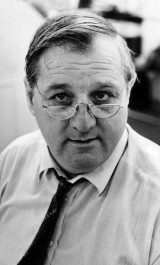 Stuart was news editor of the South Wales Echo for most of the 70s and 80s and went on to deputy editor-in-chief of the sister Celtic weeklies in South Wales. The son of a Swansea toolmaker, Stuart, left, got his first journalism job aged 19 at the Swansea Evening Post, before moving to the Bristol Evening Post. In 1969 he emigrated to Zambia, where he trained journalists for the government, but returned after three years to join the Echo as news editor. Media Wales managing director Alan Edmunds said: “I am sure most of us who worked in Stuart’s newsroom would say he was the finest news editor imaginable. “He created this distinctly family environment, with so much wit and humour, that was also incredibly demanding and professional. “His attention to detail was phenomenal. His journalistic instincts were superb. Former Echo local government editor Philip Nifield, a colleague for more than 25 years, added: “Stuart was a brilliant journalist who helped and inspired many reporters, myself included. Stuart held the news editor role until the early 1990s before spending the last decade of his career as deputy editor-in-chief of the Celtic series, where he oversaw circulation growth among its titles. He eventually retired aged 62 in 2001. Away from journalism he served as a Scout Leader and was also a season ticket holder at Swansea City FC. Stuart and his wife Bet, 74, celebrated their 51st wedding anniversary last October and had four children: Jane, 50; David, 47; Mike, 46; and Christina, 43. His funeral will be held at 11.15am on 3 February at Bridgend Crematorium. A fantastic news editor who taught me the ropes as a trainee on the Echo in the early 80s. He was a mentor to so many people who, like me, owe him a huge debt of gratitude. As well as a great teacher he was a genuinely nice person.